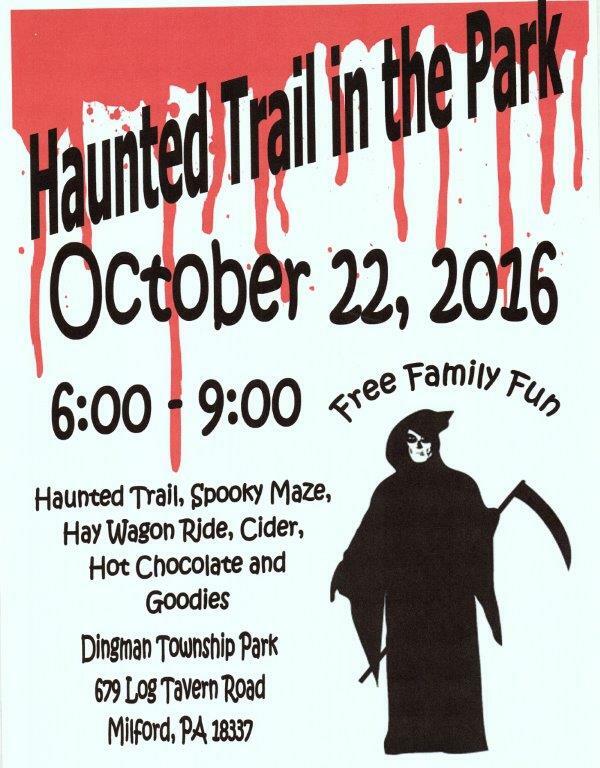 It was a dark stormy night in the haunted forest of Dingman Township. Okay, it was more like a dark, drizzly and windy night yet almost 500 of the area's youth braved the weather and crept past the monsters that were lurking along the Haunted Trail. The well attended, hopefully annual event, was a production of the Dingman Township Parks and Recreation Commission. It featured a path through the oaken forest populated by over 30 zombies, monsters, and other creepy creatures looking to feast on young flesh. The few that survived could further tempt fate by entering the thoroughly horrifying Spooky Maze provided by the Eastern Pike Soccer Club. Those too young, too old, or just not brave enough to risk their lives on the trail could take the much safer hayride or hang out at the snack bar for free hot chocolate and apple cider.